The composers of the most popular guitar concerti didn't play the guitar. In fact, most composers don't. On the other hand, the public, given half a chance to love any modern music at all, loves guitar concerti, so composers continue to write them. Britten, who turned out several important guitar works, was given a chart and a pep talk by his performer, Julian Bream. This has both advantages and disadvantages. On the one hand, the composer can set his invention free. On the other, he doesn't really know what's possible. His invention may outrun anybody's technique or lag pitifully behind. The three guitar pieces here represent a mixed bag. To each one's credit, none falls back on what has become the familiar resort of the Spanish guitar idiom. All were written for Sharon Isbin, whom we should commend on her enterprise in commissioning and learning new work and on her willingness to chance a dud. None of these works turned out to be another Concierto de Aranjuez, but does anybody really want another one? I admit I'm no Corigliano devotee. When his music doesn't bore me, I generally find it downright ugly. For reasons I don't really understand, critics keep comparing him to Barber. This suggests to me that they haven't listened closely either to Barber or to Corigliano. Barber, after all, has a distinct musical personality. Corigliano remains for me faceless and unmemorable, despite his willingness to explore new ideas with just about every piece. Troubadours runs about twice as long as its material warrants. Indeed, it takes about three minutes into the piece before anything remotely interesting begins to happen. Corigliano seems to aim for a Parting Back the Mists of Time effect here, so we get, in essence, three minutes of white noise before we arrive back in troubadour times. Once there, things pick up, with a lively estampie and bransle and a reflective chanson. The guitar writing, however, to my ear derives from Britten's take on Renaissance lute music (particularly Gloriana's "Second Lute Song of the Earl of Essex"), but this could be a function of Corigliano's source material. The chanson seems to me the emotional core of the work. If he could bring this off, I'd forgive him anything. 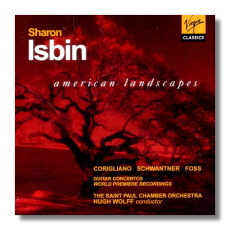 But Corigliano doesn't quite strike paydirt, a lack that seems to afflict much of his output. He's at least 50. Shouldn't we expect something absolutely wonderful by now? Joseph Schwantner, against the odds, began as a rock guitarist. He has since distinguished himself as a classical composer, with a Pulitzer, yet. And, yes, the Pulitzer is a Big Deal, since it's probably the most visible composition prize in the country. Schwantner lavishes craft on each piece. His works show great formal elegance. However, with rare exceptions (New Morning for the World is one of them) he seems to rewrite the same work. He very seldom pushes his language to real risk or real exploration. This, for example, is the Schwantner Piece for guitar. There's very little here we haven't heard before from this musician. A composer friend of mine pointed out that even the guitar writing is pretty conventional, ignoring the guitar giants of the past 40 years. Where's Berry, Montgomery, Little Milton, Hendrix, Richards, Zappa, or Van Halen? Schwantner, if anybody, could give us a marvelous take on these guys. Instead, he sticks us with Contemporary Genteel, or Sewing-Machine Contemporary. I suppose if you haven't heard a Schwantner work before, you could start here as well as anywhere. In the early 60s, Lukas Foss, one of our most interesting musical minds, forsook his brand of neo-classicism (he was its last brilliant practitioner) for more than a decade of constant experiment that led him to group improvisation, aleatorics, minimalism, and post-modernism before anybody thought to call it that. Even the failures impressed one with moments of strange new beauty. Stravinsky was a fan. When Bernstein looked over his shoulder, he saw Lukas Foss and Paul Bowles and paid both men's music the sincere complement of appropriation. Foss is no guitarist, and, as a showpiece for guitar technique, American Landscapes comes up short. He seems to regard the guitar as a violin without a bow, and in this follows Vivaldi's precedent. Still, the piece astonishes you. Foss has absorbed his experiments, and the experimentalism within his music, still present, has mellowed a bit. Nevertheless, the concerto ravishes and manages to surprise. The title, American Landscapes, suits the musical material. Foss looks at American vernacular music both with fascination and from a certain distance. Foss broke into American music with a major piece of Coplandia – the cantata The Prairie, written when he was (oh my!) 19. Nevertheless, a comparison between Copland and Foss proves instructive. American myth penetrates Copland's soul and incites it to Romanticism and Whitmanesque rhetoric. Someone once asked him how a city boy could write cowboy music. Copland responded perfectly that every American city kid wants to become a cowboy. Foss may admire the frontiersman and the cowboy, but I doubt his psyche has ever harbored the fire to be one. For the power of the myth, because it means so much to him (and not just artistically), Copland risks sentimentality. An opera like Foss's The Jumping Frog of Calaveras County brings up one vibrant phrase after another from the well of American folk music and turns it until it dazzles. But Foss admires without identifying. The miners of Calaveras are quaint and funny, but even Mark Twain, having fun at their expense, identifies himself as one of them. "These are my neighbors. This is me." Foss has lived in the States without ever becoming completely of it. After more than fifty years, traces of an accent linger – both spoken and musical. Still, the fascination of the new-found land remains. The first movement evokes, to me, both the grand repose of the Baroque concerto and American rock and roll, with "power chords" stabbing through at unpredictable moments – the idiom of Foss's Bicentennial American Cantata. The second movement sings a set of variations on the American folk ballad "Wayfaring Stranger," heartbreaking and unpredictable at the same time. The finale transforms the guitar into bluegrass mandolin with a tour through fiddle tunes like "Dan Tucker" and "Old Joe Clark." It flashes and spats like fireworks without letup, and with an Ivesian joke at the end, cunningly designed to bring an audience to its feet. This is one gorgeous work. Isbin has proven that she's got fingers and brains. The visceral impact of a work, however, seems to miss her. However, Pepe Romero, a far less patrician artist than Isbin, can excite you just by the spirit in his playing, just as Pavarotti's voice can excite you, even though Pavarotti's no Fischer-Dieskau. 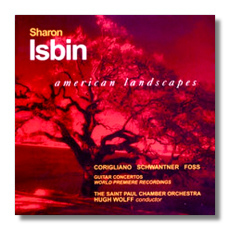 I doubt that Isbin's really the "concerto type." She does beautifully in the solo repertoire, particularly that of Bach. In this program, however, she apparently hesitates to push herself forward among the group. She does best in the Schwantner, but that may arise from the composer's greater familiarity with the guitar and the ability to write stuff that "sounds." Still, Wolff and the St. Paprovide the lion's share of the thrills.